The June Greater Atlanta Coin Show enjoyed a bourse filled with dealers and their showcases along with visitors busy in the aisles looking at all the treasures on display. We appreciate all of the people from the many visitors to the dealers to the security and to the hotel staff that helped make the June show a success. Outside, the weather offered a pretty late spring day with temperatures in the 80s, mostly sunny skies but with some thunder and brief showers around the area in the mid-afternoon. Of course, people speculated about the prices of the precious metals - will they go up, down or continue to bounce as they have for most of the year. Some people brought collections to be appraised, some came to sell while others came to buy. Of course, there are those that came curious to see what was on display (you're always welcome, and admission is free). And, some came to search for that special treasure to add to their collection. Some were successful, others plan to return to continue their search. Remember, the dealers buy and sell between the monthly coin shows and bring some of the same items but also add different items to their displays each month. This month, we are highlighting some of the more recent modern US Mint collectible sets that were on display at the show. First, let's take a look at three Coin and Chronicles sets. 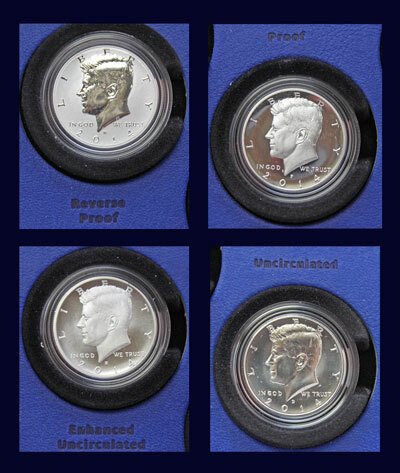 Each of these sets contains a reverse-proof presidential $1 coin, a presidential medal and a presidential stamp. The dollar coins are legal tender, and the presidential medals are silver, though not legal tender. 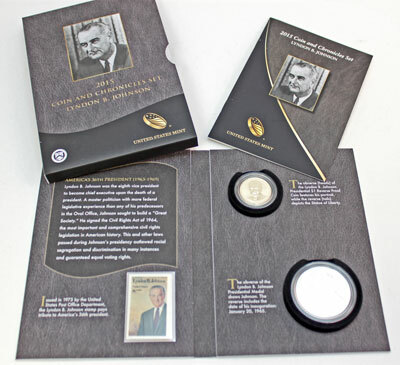 The sets consist of an outer sleeve that contains a booklet describing the man and the president and a bi-fold holder displaying the coin, medal and stamp. 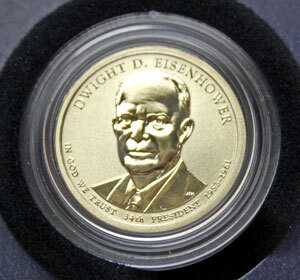 The presidential $1 coin has a portrait of Dwight D. Eisenhower on the obverse with the standard liberty reverse. The companion presidential medal also has a portrait of the president on the front. 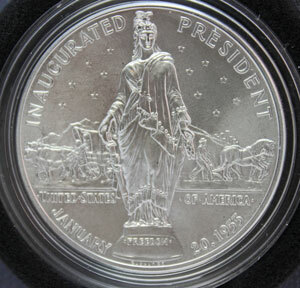 The back of the medal shows an image of the Freedom statue from the top of the U.S. Capitol building along with the date of Eisenhower's inauguration, January 20, 1953. Next month, the coin show will continue to have a variety of numismatics and other collectibles including ancient, colonial, early American and modern coins along with foreign varieties, currency notes and bullion metals (silver, gold, platinum, etc). Mark your calendars to visit the next monthly Greater Atlanta Coin Show on Sunday, July 10, 2016. Behind the statue of Freedom, a covered wagon pulled by two oxen moves to the left with mountains in the background. A farmer plows using a team of horses to the right with a city of high rise buildings in the background. 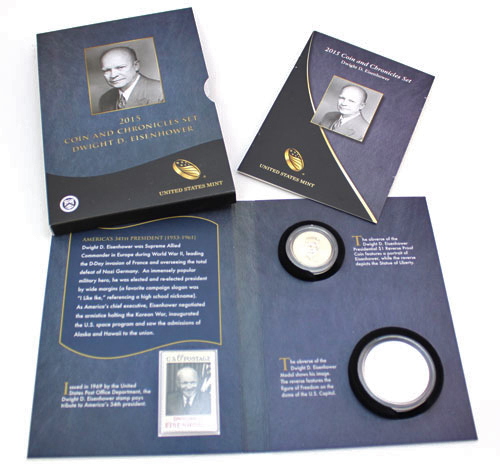 The Eisenhower Coin and Chronicles set also includes a six-cent postage stamp issued in 1969 featuring a picture of the 34th president. 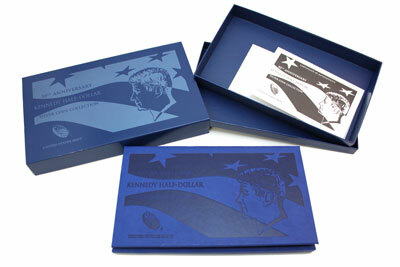 Taken in order, the next Coin and Chronicles set features President John F. Kennedy. 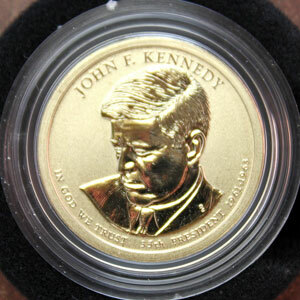 The Kennedy Presidential $1 Coin shows him with his head bowed as if he is looking down. 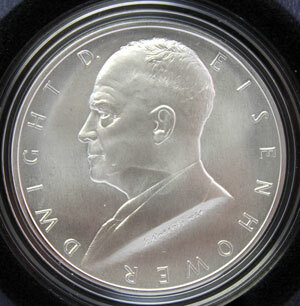 The presidential medal's obverse has a portrait of Kennedy similar to the half dollar coin. 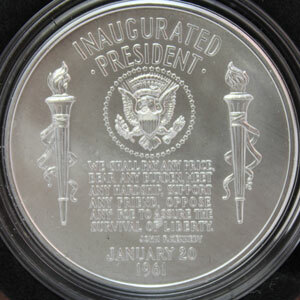 Its reverse shows the date of his inauguration, January 20, 1961, along with an excerpt from his inaugural speech, "We shall pay any price, bear any burden, meet any hardship, support any friend, oppose any foe to assure the survival of liberty." 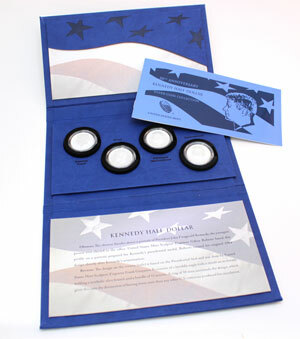 The set contains a Reverse Proof, a Proof, an Enhanced Circulated and a Circulated version of the 2014 Kennedy Half Dollar Coin. The US Mint produced each coin from a different mint location and highlighted their different processes: West Point - Reverse Proof, Philadelphia - Proof, San Francisco - Enhanced Circulated and Denver - Circulated. 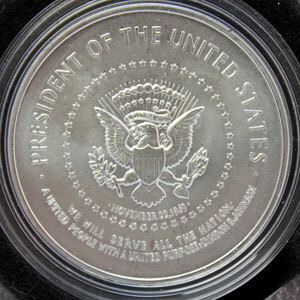 The medal's reverse also includes a small image of the presidential seal with torches - one on either side of the quote. 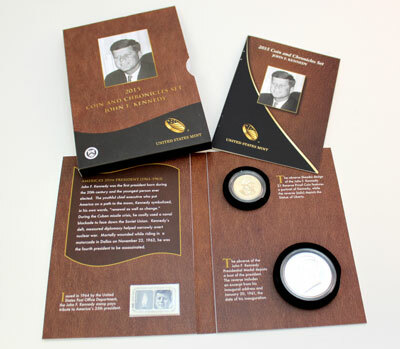 In addition, the Coin and Chronicles set includes a five-cent stamp issued in 1964 to honor the 35th president. 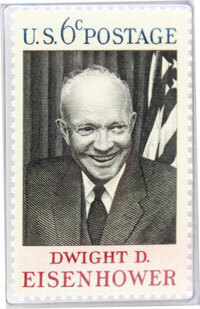 The stamp includes the words "and the glow from that fire can truly light world" around a flame and his portrait. 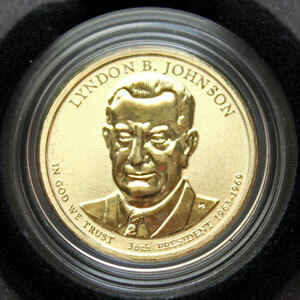 The third Coin and Chronicles set features Lyndon B. Johnson, who, as vice-president, became president upon the assassination of President Kennedy. Oddly, the US Mint's staff failed to match the description of the presidential medal's reverse to the actual detail included on the medal. The reverse shows the date of his first presidential oath of office, November 22, 1963, taken after President Kennedy's death, on its reverse. 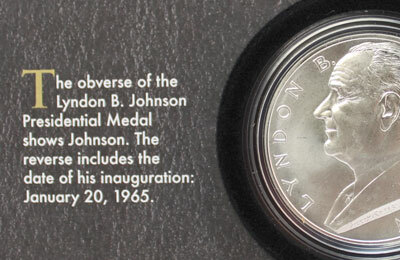 However, the description beside the medal states the date of his presidential inauguration after he won the election. The medal's reverse also includes an image of the presidential seal with a quote at the bottom, "We will serve all the nation, a united people with a united purpose." 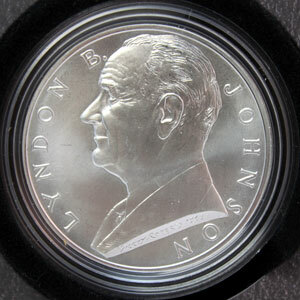 The obverse of the Presidential $1 coin shows a frontal portrait of President Johnson where the medal shows a profile image. 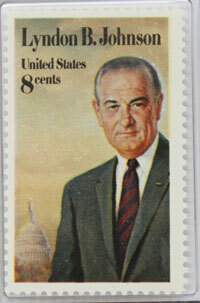 The stamp in the Johnson Coin and Chronicles Set shows an eight-cent stamp issued in 1973 for the 36th president. 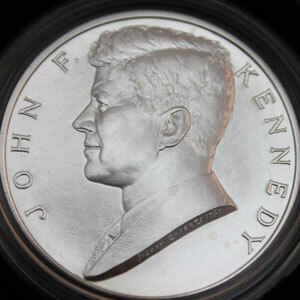 The next highlight for the June coin show is another modern US Mint collectible remembering and honoring President Kennedy. This set represents the 50th anniversary of the Kennedy half dollar coin and includes four different 90% silver varieties of the 2014 version. These three just happen to occur chronologically with the Eisenhower Coin and Chronicles set being first.